There is an enormous amount of information on the pipes available on the internet. There are dedicated Uilleann Pipes websites and blogs, many pipe-makers have their own website, and channels such as YouTube have lots of music. 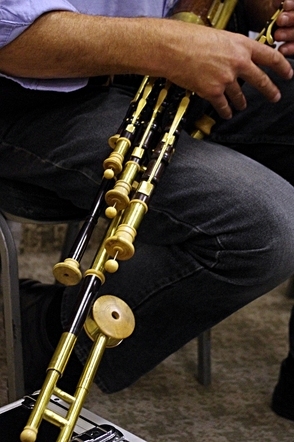 The main source of information, however, is the website of the Irish Pipers Club 'Na Píobairí Uilleann' (NPU): http://www.pipers.ie. NPU site has footage of performances, a tutorial for pipers of different levels, information on reed-making, links to the sites of pipe-makers, and lots more. Buying a set of pipes. People who want to buy a set of pipes have got a wide range of makers to choose from. The NPU website gives an up-to-date list of professional pipe-makers. Although we can be reasonably confident that the majority of professional makers supply instruments that play well, there are, nevertheless, substantial differences between the pipes of different makers in terms of overall design. The design of the instrument not only refers to its looks, but also affect the way it handles and, to some extent, its tonal qualities. Thus, it is important to do some research and choose an instrument that suits the player. There is also a market in used pipes. Pipes are expensive instruments and beginning pipers may be tempted to buy a second-hand set to start off with. When buying a used set, make sure to find out who the maker is and if he is still in business – the pipes may need repairs or a general overhaul to get them back into playing condition. There are many things that can happen to a set of pipes over the years. Please be aware that many pipe-makers are not keen to do work on other makers’ instruments - certainly not if the latter should still be in business.